SEVEN DAYS IN MAY had the enthusiastic cooperation of the Kennedy White House, with JFK not only a fan of the book by Fletcher Knebel, but fully aware, after dealing with the insanity of the brass hats in the Pentagon (LeMay & his ilk) over Cuba and Laos that a military plot to overthrow the government was not at all a stretch. By the time the movie came out in 1964 Kennedy was three months gone, killed by someone most of us know was not Lee Harvey Oswald. 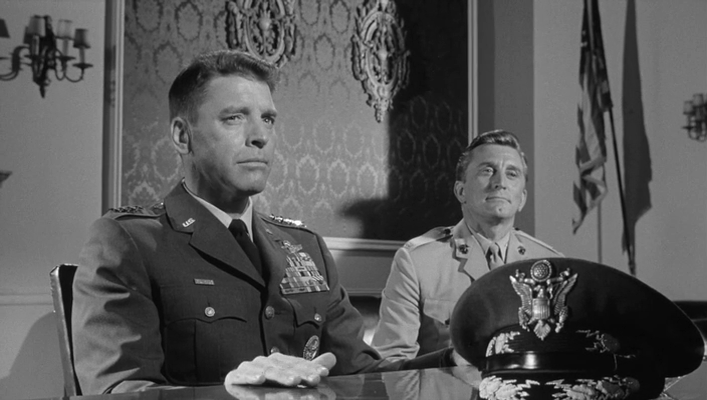 The Joint Chiefs got in real life what they sought in the film. 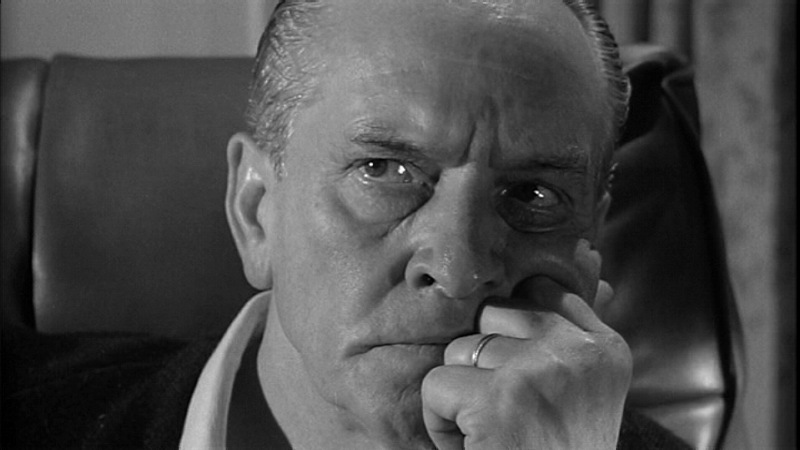 “Criminally weak sister” Fredric March is the President, and his treaty with the Soviets has right-wing general Burt Lancaster ready to pull the plug on the whole bothersome voting nonsense. Suspenseful from the start, thanks to Jerry Goldsmith’s score, and maintained throughout by John Frankenheimer’s assured direction of Rod Serling’s whip smart script. 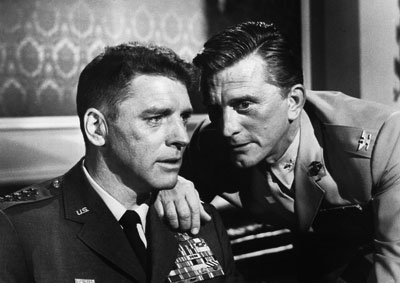 Apart from the splendid crackle of the March-Lancaster duel, there is excellent work from a refreshingly low-key Kirk Douglas, a noticeably life-worn Ava Gardner (albeit still smashing that year in The Night of the Iguana), an enlivened Edmond O’Brien (nominated for Supporting Actor), and the ever-convincing Martin Balsam. 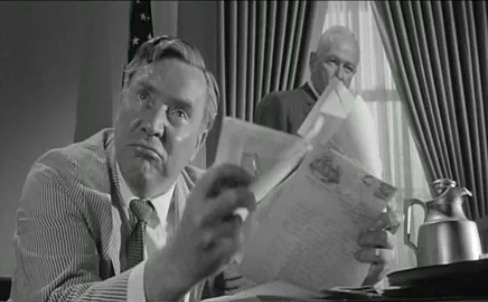 Locking in the tension are Andrew Duggan, Hugh Marlowe (as a blowhard commentator), Whit Bissell, John Larkin, John Houseman, George MacReady, Richard Anderson and Jack Mullaney. The crisp black & white Art Direction was also nominated. 118 minutes move by quickly. Critics applauded, audiences responded well, making it the 19th most popular movie of the year. Lancaster modeled his interpretation after the colossal casual arrogance of Douglas MacArthur, the bombs-away blindness of Curtis LeMay and the megalomania of the recently dismissed Edwin A. Walker. Considering where our treasure and blood has gone in the decades since, you may wonder if there really amounts to much difference between the chickenhawks who run us into shame and debt other than that some wear uniforms and scowl and others wear business suits and smirk. Where are President’s Fredric March or Henry Fonda when we need them? Guess we can count on Morgan Freeman until the real deal comes along. Pray if you think it helps.